For most of the last decade, I lived in the crazy, cold, contradictory state that is Wisconsin. I wrote research papers in Madison, performed poems in Milwaukee, walked picket lines in Jefferson, organized student conferences in Eau Claire, led artistic workshops in Green Bay, spoke at my roommate's wedding in Merrill, and went camping with my future wife at Black River Falls. A big-city kid from the East Coast, I never fully got used to the overwhelming whiteness of Wisconsin -- the winter, and yes, the people. But I eventually learned how to wear five layers in February, and that amidst the farms and abandoned factories, there was a working-class people with a strong populist ethic. As my freshman roommate from Wausau once told me, "Josh, I don't follow politics. I just hate corporations." Fast-forward to 2011: the new Republican Governor, Scott Walker, has declared war on my old roommate and all Wisconsin workers. Under the guise of a budget deficit, Walker just put forth a bill that would destroy the unions that represent teachers, social workers, and over 100,000 public employees. He's also making huge cuts to schools, health care, public transportation, and anything that actually helps people live. Want more crazy? Walker ordered the National Guard to get ready to respond to a strike or any resistance to his plan. The last time Wisconsin called in the National Guard during a labor dispute was way back in 1886, when Guard militiamen shot on a rally of Milwaukee workers advocating an 8-hour work day. Five unarmed workers were killed in the massacre. I loved living in Wisconsin. Truth be told, I hated it many times too, especially when its ugly side came out like now. I was fighting this same struggle during most of my junior and senior years at UW. Our campaign demands were nothing new: lower tuition for students, better health care for workers, higher taxes on the rich, and a real investment in public education over private incarceration. That was with Jim Doyle in office. But now with this dude Walker, it's at a whole new level. Of course, the people aren't going down without a fight. There have been unprecedented demonstrations at the state Capitol in Madison every day this week -- from 1,000 the first day to over 25,000 yesterday. 1. The deficit is a made-up crisis. Like most states, Wisconsin is struggling in the recession, but the state government isn't actually broke. The state legislature's fiscal bureau estimated the state would end the year with a $121 million balance. Walker claims there is a $137 million deficit -- but it is not because of an increase in worker wages or benefits. According to the Capital Times, it is because "Walker and his allies pushed through $140 million in new spending for corporate and special-interest groups in January." Nice. A man-made "crisis" as an excuse to push neoliberal cutbacks: Shock Doctrine, anyone? 2. Even if there was a deficit, blame Wall Street -- not the workers. The economy isn't crumbling because state workers in Madison have decent pensions. It's because Wall Street bankers stole our money, Bush and now Obama have us in two trillion-dollar wars, and states like Wisconsin keep spending more on prisons than schools. What do the rich pay? According to the Wisconsin Department of Revenue, corporate tax income has fallen by half since 1981 and over two-thirds of Wisconsin corporations pay zero taxes. 4. This is not "just another Madison protest." Madison is famous for its progressive tradition, but this is more than just another march down State Street. This struggle is engaging people across the state -- not just Madison and Milwaukee, but LaCrosse, Eau Claire, and outside Gov. Walker's home in Wauwatosa. This struggle is multi-racial, multi-generational, and multi-issue. Working- and middle-class white folks (the majority population) might finally realize that long-term unity is stronger than short-term tax relief. Looking for the progressive antidote to the Tea Party? They're brewing something in the Badger State. 5. Public worker unions were founded in Wisconsin. The first union for public employees was actually started in Madison in 1932, to ensure living wages for the workers and end political patronage for government jobs. The biggest public union, AFSCME, was born right where the protests are happening today in Madison. Wisconsin has always had a dual legacy -- home to the last Socialist mayor in the country (Frank Zeidler of Milwaukee) and the ultimate anti-Communist himself, Joe McCarthy; more recently, both progressive Sen. Russ Feingold and immigrant-basher Rep. Jim Sensenbrenner -- but the Dairyland's populist ethos can be traced back to the Progressive Era and its public unions. 6. Hurting public workers will not help you get a better job. Many conservatives, and even some liberals, argue that we need to "bring public workers' benefits down to the level of private workers." First off, it's not true that public workers are better off -- they usually get lower wages in exchange for better benefits. More important, though, is the idea that we should raise all boats, rather than continue this race to the bottom. Russ Feingold said yesterday that "Republicans are trying to pit private workers against their public counterparts." No more divide and conquer. Yes, people with a private-sector job (or, people who like 50% of black men in Milwaukee don't have a job at all) have a right to be angry: but that anger should be reserved for the companies who are downsizing and outsourcing those jobs, not for middle school teachers and the lunch lady. 7. This is about more than unions. This is about public education, affirmative action, immigrant rights, stopping foreclosures, and basic human rights. This is about how much the Radical Right thinks they can get away with. This is about drawing a line in the sand -- if first they come for the unions, who will they come for next? 8. The country is watching Wisconsin. What happens this week in Madison has national ramifications. Right now, everyone's eyes are on Wisconsin. The governor of Ohio and Tennessee are threatening to adopt similar legislation -- and Obama has his own conservative budget proposal at the federal level. If they can force it through relatively liberal Wisconsin, your state could be next. 9. Wisconsin was watching Egypt. News travels fast, and uprisings inspire each other across continents. The protesters out on the Madison streets watched the millions of Egyptians who successfully, nonviolently took down their dictator. 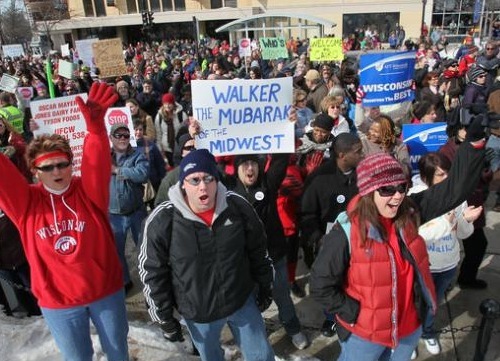 Many of them are now carrying signs like the one below calling Scott Walker "the Mubarak of the Midwest." And while the American media loves the union workers that toppled a dictator in Egypt, CNN has little sympathy for the workers that will be silenced right here in the heartland. 10. Who's Capitol? OUR Capitol! This is our moment. Our state. Our growing movement to change the course of the country. The legislature could vote as soon as today on Walker's bill -- unless the real Badgers stand up to stop him. The protests are escalating every day, inside and outside the Capitol. To all my Madison folks, stay strong and know that we're with you. To the rest of the country, spread the word, donate to the legal defense funds, and make sure your own states don't go down this same road.